Napoleon Bonaparte wrote the following, in his memoirs from St. Helena: J’ai a me reprocher une tentative sur cette colonie, lors du consulat; c’était une grande faute que de vouloir la soumettre par la force; je devais me contenter de la gouverner par l’intermédiaire de Toussaint. (Thanks to Madison Smartt Bell in whose magnificent historical-fiction trilogy on the Haitian revolution I found that.) He’s basically saying that he made a big mistake trying to reconquer the self-liberated former slaves of this colony, instead of being content to rule the colony through their leader. 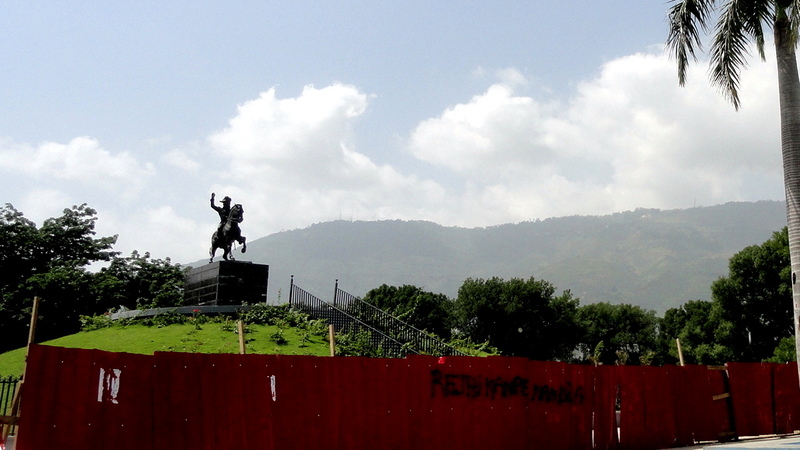 I took the photos in this entry during a weekend morning exploring the heart of downtown Port-au-Prince, which is well-stocked with monuments to this country’s absolutely astounding history. So I’ll just give a quick and highly selective review of that history and ask a what-if or two. Imagine that a man born into slavery, and without formal education, rises to a point where he organizes and leads a slave revolt which fights off the Spanish and British, restoring control of Hispaniola (the whole island, at one point) to the French Republic. Toussaint Louverture, spurred by Napoleon’s statement that the colony would need some new laws, then drafts a constitution which leaves the colony basically part of France but with a lot of home rule (some quotes are seen below in the three tall photos); and Napoleon basically responds by sending out a massive fleet, betraying and arresting Toussaint so he dies in prison in France…and then the former slaves of Saint Domingue get really mad, and with the help of yellow fever and the leadership of Dessalines and a few other key formerly-slave generals manage to permanently push the French out of the island, thereby defeating one of the world’s most powerful nations. This country has an absolutely amazing history and I find it shocking, if sadly predictable, that its important place in history has rarely been appreciated beyond its shores. 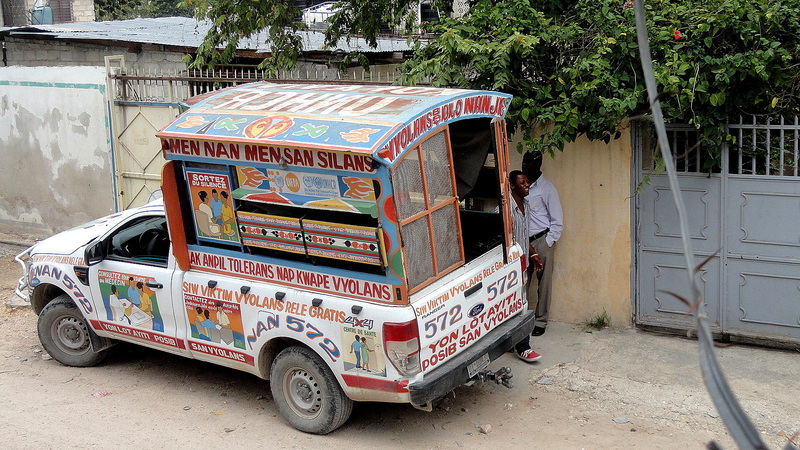 It has seemed to me since the 1980s that lots of people outside Haiti are free with opinions about what the country should or shouldn’t do, what’s right or wrong with its government or economic system, etc. – and I really wonder how many of those people with those opinions have taken time to think about (let alone interact respectfully with) the people of Haiti, their history, and their own desires as one of the earliest self-created nations in this hemisphere. 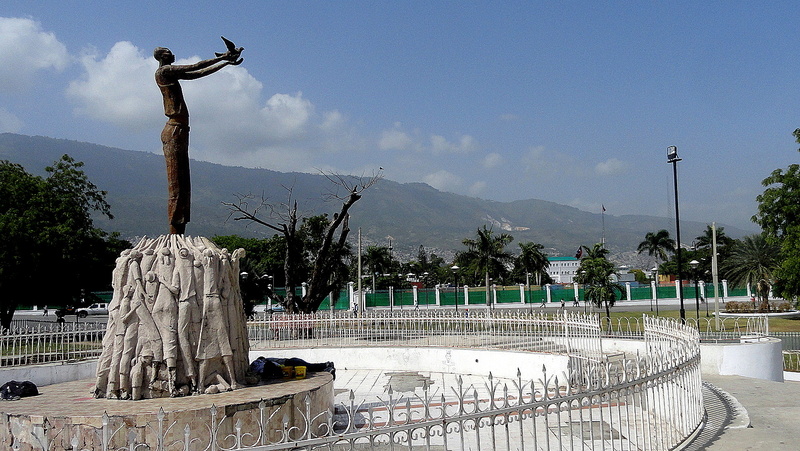 Though it’s been shattered by the earthquake and battered by violent changes of government many times in recent decades, Port-au-Prince remains a great place to ponder this country’s rich history…and to hope for a brighter and more prosperous future with, might I add, a bit more external respect shown for this country and its people. 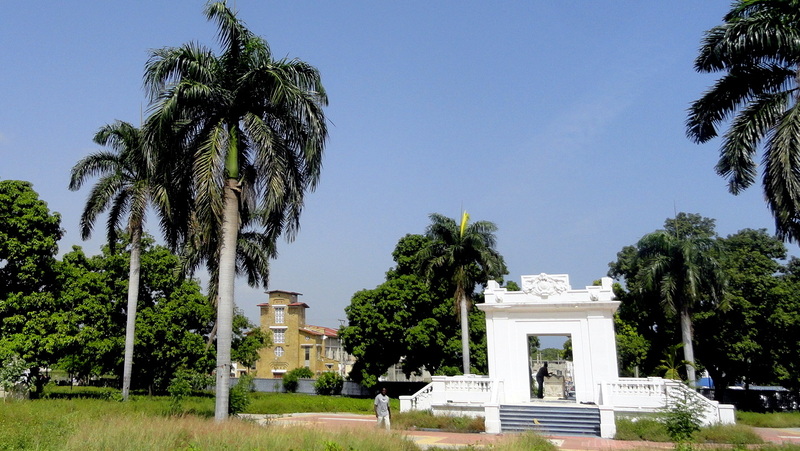 …immediately above is the monument to Dessalines. As you can tell, much of downtown is still under reconstruction but I’m told the pace seems to be picking up. 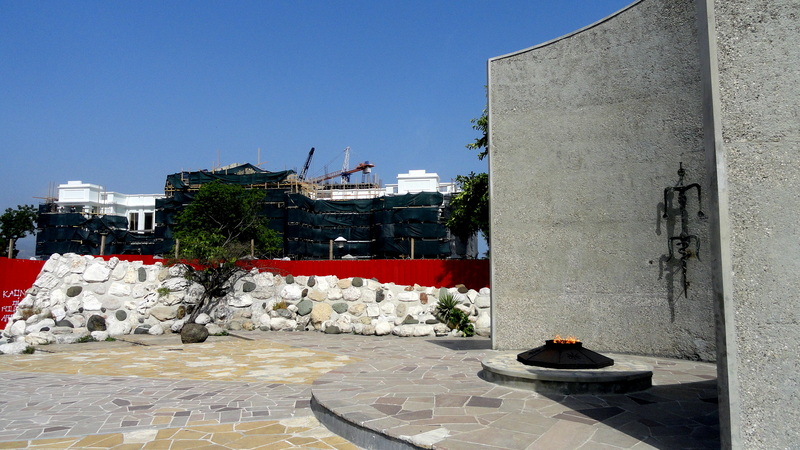 Below is the eternal flame (to honor, I think, the original self-liberating revolutionary ex-slaves), with the new court house next to it; the big statue of the man blowing the conch shell in the Unknown Maroon – maroons being slaves who’d run away to the mountains during colonial times. Further down is a tap-tap with colorful paintings against sexual and domestic violence (which showed up at the opening to our new SGBV clinic), and the lovely old medical school building, which I guess either survived the quake or has been restored more rapidly than many others. 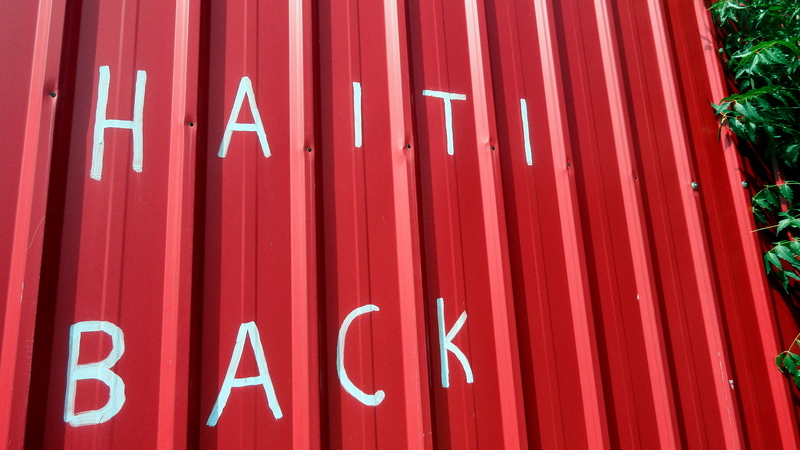 The graffiti, I believe, expresses the hope that Haiti’s coming back into its strength again.